Features thumb abduction piece with flexible stay to support the thumb. Flexible palmar stay is both removable and moldable to the patient. Thumb support adjusted via hook and loop closure for patient comfort. 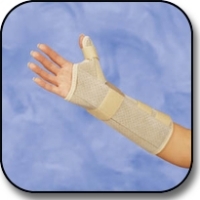 Comfortable splint provides good support and is breathable and warm. Microfleece material coats the inside of the splint, insulating the skin and allowing perspiration to pass. Osteoarthritis, arthritis, ligament injuries to the CMC and MCP joints and de quervain or hypertension injuries of the thumb.